- Be used to test motherboard problems. - Especially helpful to pinpoint where is the problem when power on the computer and find no display or machine hangs up. 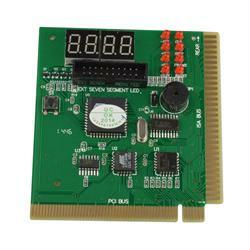 - 8 LEDs indication,easy to read LED Display on the Display,LED displays shows diagnosis result of motherboard. - Diagnosis the motherboard signal which show the problem of CPU, Memory, video card, etc.